There are a number of out of the way nooks and crannies of the Market that have lots of character, historical or otherwise. 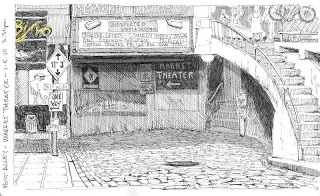 The small cobblestone road that descends behind the information booth underneath the market leads to seldom known gems like IL Bistro, The Market Theater and the Alibi Room. Great sketch! Hope you'll post more. Thanks. I love this view of the market.